Unlike sitcom where the character never learns, you will learn. A lot. Over the course of six months, you’ll attend monthly sessions where you’ll learn the different disciplines involved in writing comedy for TV, radio, digital and children’s. You’ll learn about character, archetypes, story arcs, the sitcom family, and when to be ruthless and cut gags. Even the funny ones. Now, a confession: I never really understood what the ‘C’ story is in a sitcom. But when you do a Deconstructing Sitcom session with its writer, everything falls into place. As does how jokes are crafted. They’re not there just to deliver laughs; that’s just part of their job. They also need to drive character, story, motivation – sometimes all three at once. 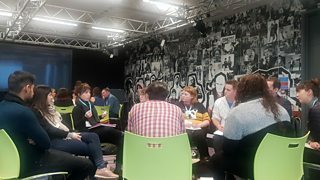 The sessions are usually held at the BBC in London, apart from the Writing for Children day, which is hosted by the CBeebies and CBBC teams in Salford. Don’t worry if you live outside these areas, your travel and accommodation will be covered. And you’ll be well fed. Man, are they feeders. For most comedy writers getting a sitcom on TV is the Holy Grail. But given the hours of comedy that are commissioned each year - including already established series – it’s pretty unlikely that as a first-time writer you’re going to get a green light for yours (though, not impossible). But does that mean we give up? Through the Comedy Room we were exposed to many avenues for comedy writers, across all platforms: Writing on existing sitcoms, panel shows, topical news shows, children’s, chat shows, even awards shows. 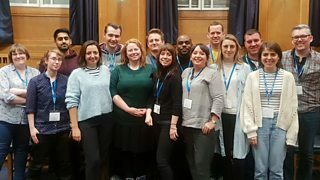 There are exciting opportunities in radio both for sitcom and light-entertainment and a hunger for podcasts through the BBC Sounds platform. Digital is huge. BBC Social, Comedy Shorts and new short-form content, Threesomes, are just a few of the ways you can get your work out there. Conclusion: Good comedy writers will always be in demand. The 2018/19 Comedy Room Writer Development Group. Do you want to be part of this year's group? Submit your script before 5pm on Monday 29th April 2019. 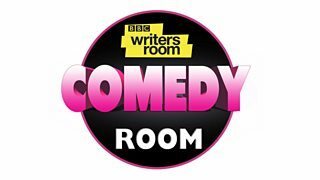 The whole raison d’être (get me throwing in French; this is what happens when you hob-nob in the BBC canteen) of the Comedy Room is to help you become an established comedy writer. So from Day 1 you’ll get live briefs. This could be anything from writing jokes and sketches for a topical quiz show, to writing content for a new TV pilot, or creating a new podcast series. It lets you try things that you might not have even considered. And it gets your writing seen; not just by the BBC, but also by independent production companies. Because I’m in Glasgow I’m also looked after by BBC Writersroom, Scotland – headed by the glorious Angela Galvin and Audrey McFadden. So if you’re in one of the ‘nations or regions’ – Scotland, The North, Wales,, Northern Ireland – follow BBC Writersroom on social media to see what your local team are up to. Once you’re on their radar, they’ll keep you posted on all the latest opportunities, invite you to industry invents and networking drinks. As a result of the briefs I’ve worked on, I’ve had paid work for development writing for a pilot, digital content for BBC Dynasties – and other work still in the pipeline. This, I hasten to add, wasn’t a session. But after listening to the many - hugely successful – writers who came to talk to us, it became clear that rejection is rife. Writers who have had hugely successful sitcom series get stuff rejected. Writers who have BAFTAs get stuff rejected. We’re no different. It took David Crane yonks to get Episodes commissioned. Yes, that David Crane. The one who wrote Friends, David Crane. The creator of one-of-the-most-successful-sitcoms-ever-written, David Crane. Even he doesn’t get an automatic yes. So next time you get a rejection, wear it as a badge of honour. You can’t call yourself a writer until you’ve earned your rejection stripes. ps A ‘no’ will still sting. Just not nearly as much. Writers procrastinate. If you don’t, what’s wrong with you? Have you no pants to iron? The thing is, if you have forever to write something, it will take forever to write. That’s a bonafide law of physics, that is. And you can’t argue with the laws of physics. Unless you’re in a Looney Tunes cartoon. One of our first sessions was with Gráinne McGuire, who as well as being very funny, is also very wise. She had loads of great tips about getting over writers' block. When you’re staring at a blank page or screen, do a little fun burst of 15 minute topical gags to pump up your creative muscles. Yes, that’s a thing. She also nailed the writer’s psyche. We’re brilliant at beating ourselves up. We obsess over what’s wrong in our writing without even the slightest nod to what’s going right. Her advice was simple: ‘Be kind to yourself’. If you’ve had a ‘bad’ writing day, see it as a necessary part of the process. You had to get all the rubbish stuff out of your system today, so that tomorrow you’ll be able to write the good stuff. Since I’ve been on the scheme I’ve been waxing lyrical to all my comedy writer pals to apply when this window came round. The reaction has fallen into two camps: The ‘hell, yes, I’d love to do that’, to the, ‘yeah, but I don’t write BBC-kinda-comedy’. That last response stumps me, as BBC comedy is arguably the broadest of them all. Their comedy output on terrestrial spans BBC One, BBC Two, BBC Three, BBC Four, all appeal to a different demographic. Think about Fleabag, Alan Partridge’s This Time, Warren, Mrs Brown’s Boys, White Gold, Jerk, Still Game, Two Doors Down. Each has a very distinctive tone, yet all are on the BBC. I’d hazard a guess that whatever your sensibilities, your script would sit comfortably on at least one BBC platform. They’re not expecting you to write for a prime-time mass, BBC One audience, unless that’s the audience you passionately want to write for. Your favourite comedies don’t even have to be made by the BBC. You just need to love comedy. And to love writing comedy. Eh? You say. And that’s a good reason to apply because? Well, because it takes the pressure off. You don’t have to write a family-based, multi-camera, studio sitcom because you read somewhere that’s what they’re looking for. All the producers who spoke to us - from the BBC and beyond - admitted that no-one really knows what they want until they see it. So just write what you want. They are not - repeat, not - looking for scripts to commission at this stage. Debbie Moon’s brilliant Wolfblood was discovered through a BBC Writersroom callout for children’s drama, but that’s the exception, not the rule. All they want is a sense of your voice. Which means you don’t have to fret too much about structure, either. Of course, know the basics. Don’t submit a 70 page script for a 30 minute sitcom. But seriously don’t lose any sleep if your inciting incident doesn’t come on page 11 of your feature. You’ll learn about structure along the way. And when you write a sitcom for real, you’ll get a script editor. So relax. Embrace the open brief as a way of showcasing the very best of your ability. I think I’m right in saying that most of us have decided to use the opportunity to work on a different project. My submission for the Comedy Script Room was a sitcom based in Glasgow. For my final script I’m doing children’s animation. As a writer of children’s books, I’ve always been interested in writing children’s TV – but in truth, was too scared to try. The beauty of BBC Writersroom is you don’t just get to try new things, you get to try new things with help from some of the best in the business. Last week I submitted my first draft (not my first draft, of course, but the first official draft) of the series pilot to Andrew Burrell (writer on Dangermouse, Jamie Johnson, Disenchantment.) He truly is cartoon royalty and for the next few months will be helping me kick my script into shape – which is an incredible opportunity. Not least because forever more I can say that I know someone who’s seen Dangermouse naked. The Comedy Room is run by Simon Nelson and Amanda Farley, who from the start become your wingman and wingwoman. Not only do they get amazing people in for masterclasses and workshops, they get you networking and meeting producers (with drinks, which helps). The kind of producers who are actively looking to make new comedy. You’re immediately in a strong position because these producers know that BBC Writersroom read through around 3000 scripts in each comedy window. Which means they will take the time to read yours. Within a couple of weeks I’d had great responses from several. Just a fortnight ago I was sitting in the offices of a production company in Camden - makers of some of my favourite telly over the past two decades - talking about my script and other sitcom ideas. I’ve met a couple of fabulous producers whom I’m talking to about various projects. This would not have happened without BBC Writersroom. The scheme helps you get you in front of people you wouldn’t normally have access too. That’s mega. Your time in the Comedy Room is never really over because you become part of the Comedy Room family, and Simon and Amanda are only ever a call or email away when you need advice. Have a listen to their Sitcom Geeks podcast from this time last year – it will tell you everything you need to know about applying. If you’re serious about a career writing comedy, this is an opportunity not to be missed. So get polishing that script.